Spin Master - Bakugan Bakugan, Battle Pack 5 Pack, Collectible Cards And Transforming Creatures, Tons To Collect! home • products • Bakugan • Bakugan, Battle Pack 5-Pack, Collectible Cards and Transforming Creatures, Tons to Collect! 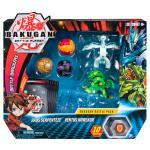 Bakugan, Battle Pack 5-Pack, Collectible Cards and Transforming Creatures, Tons to Collect! Will you leave Battle Planet victorious? 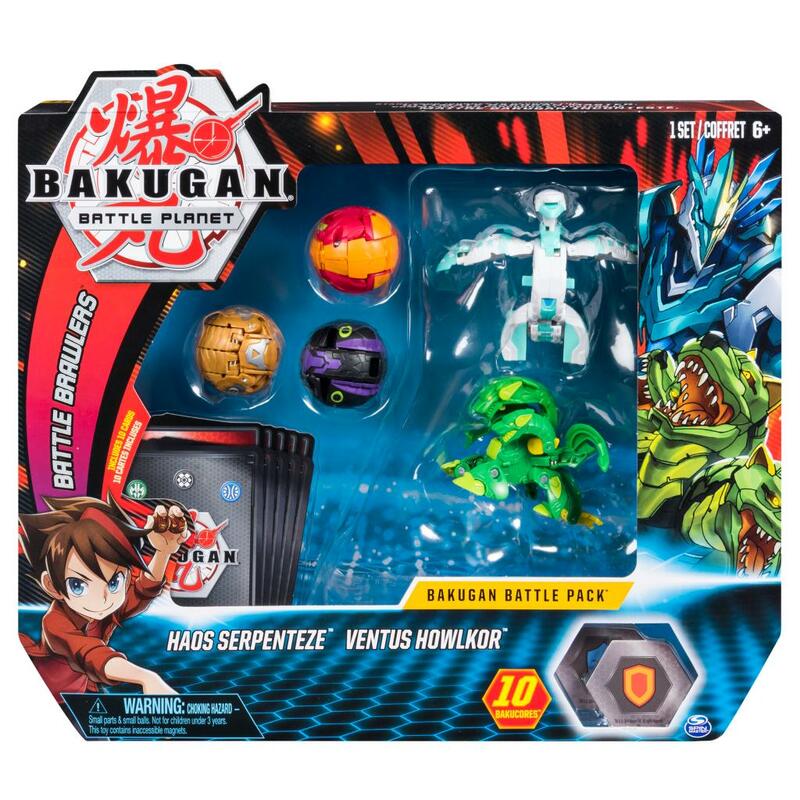 Jumpstart your Bakugan collection with the Bakugan Battle Pack! 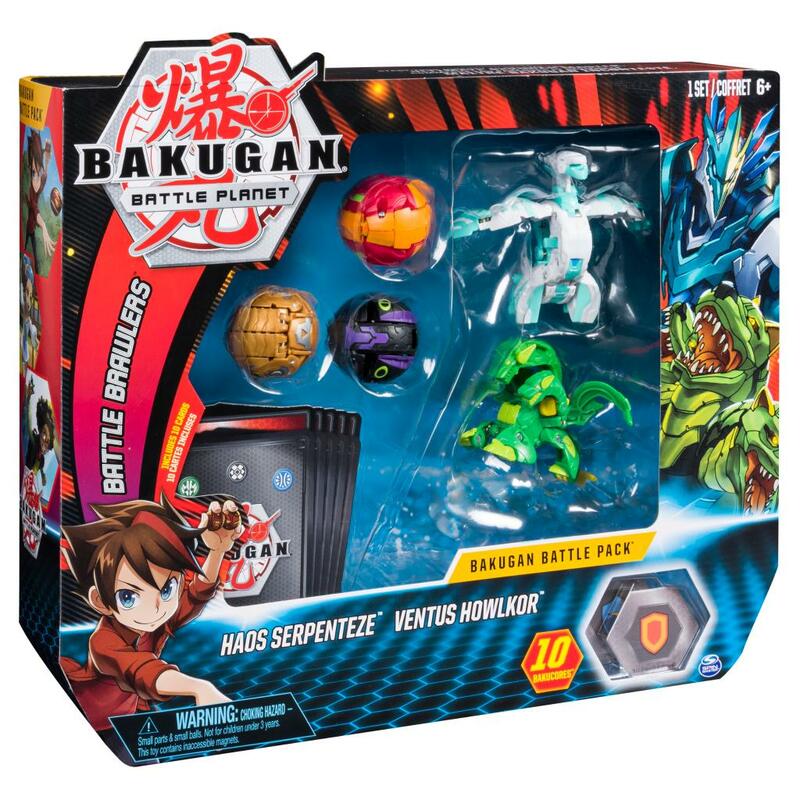 Inside this pack, you’ll find two fierce Bakugan Ultra, three Bakugan, 10 powerful BakuCores, 5 Character Cards and 5 collectible Ability Cards. 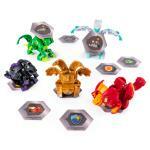 Roll your Bakugan over the included BakuCores to POP OPEN Baku-Action! Or, roll your Bakugan Ultra to make your fierce creature perform an epic LEAP OPEN transformation! Armed with your Bakugan, you can roll against your friends to see who will become the Ultimate Bakugan Master! The fastest way to build your own epic Bakugan army is with this set! Roll into action with your very own Bakugan Battle Pack! BAKUGAN BRAWL! 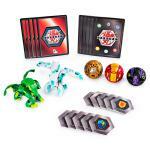 INCLUDES 5 TRANSFORMING BAKUGAN: Jumpstart your Bakugan collection with the Bakugan Battle Pack. This pack has 5 collectible Bakugan figures plus all the cards you need to start battling your friends. Prepare to enter Battle Planet! ROLL TO TRANSFORM: Roll your Bakugan and these fierce creatures will POP OPEN. Roll your Bakugan Ultra and they’ll LEAP OPEN, picking up their BakuCore and revealing its power. How do you roll? COLLECT, TRADE, BATTLE: Build your Bakugan collection with the transforming Bakugan, BakuCores, Character Cards and Ability Cards included in this pack. Then, trade with friends or head into battle to see who is the Ultimate Bakugan Master! The Bakugan 5-Pack is a great gift for kids aged 6 and up. Amass your own army of transforming collectible figures and roll into Baku-action!